When my wife and I go to the movies, I typically buy a third reserved seat so I can keep the seat next to me empty. I prefer — but by no means need, either physically or psychologically — the extra space. My wife finds this new habit of mine rather absurd and extravagant. I agree. But is it unethical? WILL, AUSTIN, TEX. Klosterman's answer to 1: First of all, let me say that I also agree with your wife. Furthermore, I’d like to note that this problem doesn’t apply to most Americans, because movie theaters with reserved seating are relatively rare. But I still want to answer your question, as it (somewhat incidentally) illustrates how many day-to-day ethical quandaries should be considered and addressed. If you buy an extra ticket for a movie playing in a theater that’s only half full, you’re actually being more morally conscientious than necessary. Most of the time, finding an empty third seat is not that difficult — but by paying for a third ticket, you are admitting your intentions up front and ensuring that you won’t extract more from this experience than you invested. That’s good citizenship. If the theater is full, however, you should never do this. Yes, it’s certainly within your legal right. But you are placing your own gratuitous comfort — which you concede is not necessary — above a stranger’s ability to merely experience the same film. Under those conditions, the benefit you are taking for yourself is smaller and less meaningful than what you’re taking away from another person. That’s bad citizenship. Consider the most extreme example of your policy: Let’s say I prefer to watch movies in a totally empty theater, where I am the only audience member. I also hate worrying about specific showtimes, and sometimes I don’t know what movie I want to see until I arrive at the multiplex. I also happen to be an eccentric billionaire. What if I decided to just buy every ticket to every showing of every movie in my entire community, thereby providing myself the opportunity to see whatever I wanted whenever I felt like it, without dealing with other moviegoers? Clearly, this would make me a jerk. Without committing theft, I’d still be damaging public good. And this, ultimately, is the crux of the question — if you are going to participate in a collective, public experience, you need to consider the lives and opportunities of other people. If you don’t want to do that, you should probably stay home. 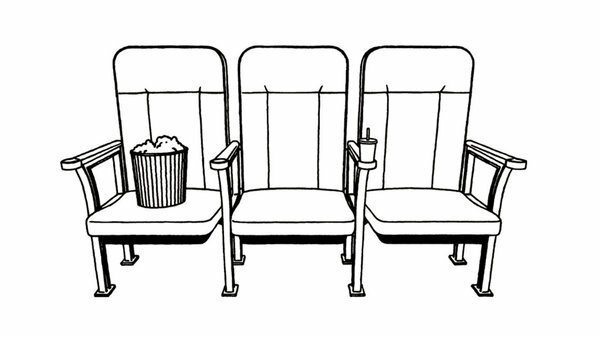 Klosterman's answer to 2: This is different from the letter above, because you’re saving a seat for someone rather than no one. That’s not unethical. You do not, however, have any ability to enforce this reservation. If another rider comes along and asks, “Is this seat taken?” you can certainly say, “I’m saving this for a companion who is still boarding the train.” But the other rider has the right to ignore your request.